This is a quick yet very interesting recipe. These raw cacao truffles are soft and delicious. A perfect gift or treat this festive season or any other occasion. They are super easy with nuts and use dates as a sweetener. A great healthier alternative! I find it therapeutic to roll these sweets however since the mixture is quite gooey I wash my hands after rolling ten of them. In this way, less dough sticks to the hands. These balls are called truffles as they resemble the shape of the truffle fungi, they do not contain any truffles. This name originated in France in 1985 (source). Soak the dates in hot water for about 5 minutes until mushy. Start by blending the nuts and seed in the food processor. Process until very fine. You want a powdery consistency. Then remove the dates from water and add the dates and cacao powder to the food processor and blend until you have an even consistency. You will have a gooey consistency, so you might want to scrape the sides using a spoon. Prepare a tray with 2 tablespoons cacao powder at the bottom. Start making the balls by taking a teaspoon of the dough and rolling it into a ball between the palms of your hands. When a ball is ready, place it on top of cacao powder. 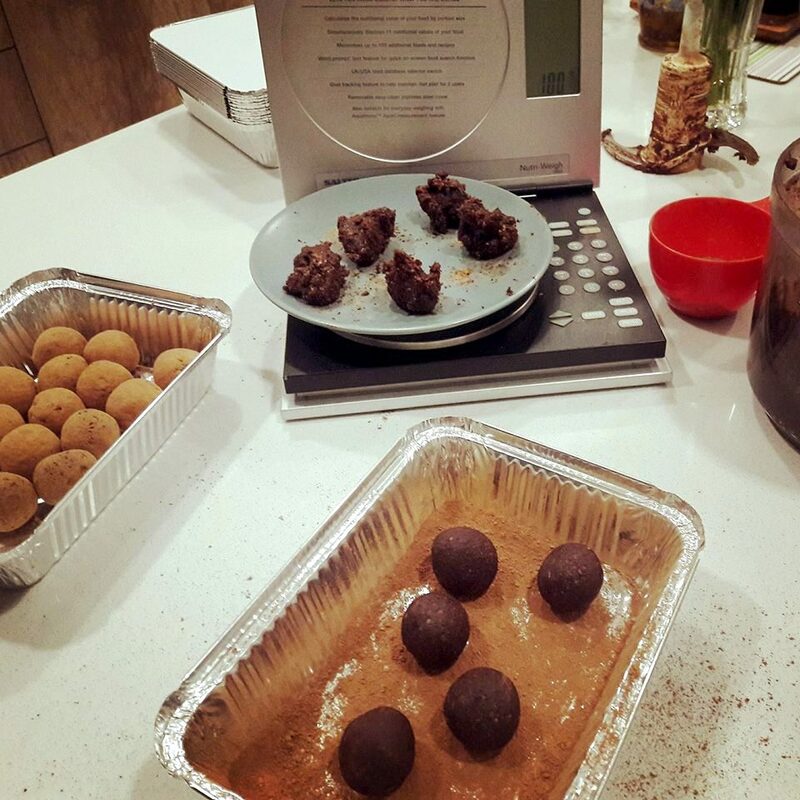 When you make about 10 balls, wash your hands and gently shake the tray to coat all balls in cacao powder. 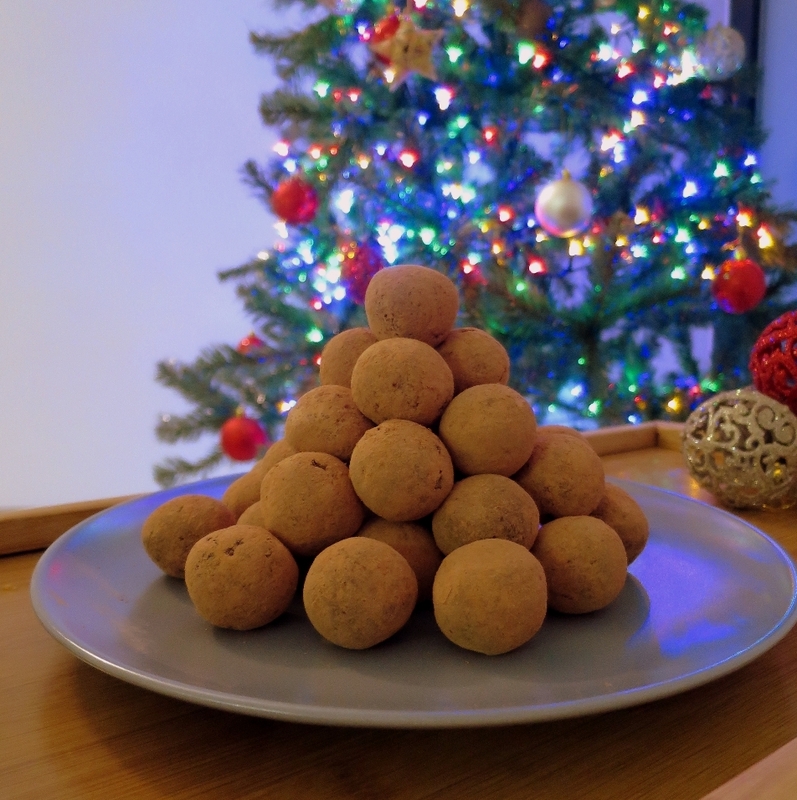 I shaked off the excess cacao from each ball. Store in refrigirator until ready to ere. Remove from refrgirator 30 minutsbefore serving to allow them to come at room temperature.